This birthday noodle dish has lived a long and celebrated life. Birthdays were a pretty standard affair for me growing up, with one exception. Before cutting into the sponge cake with layers of whipped cream and fruit topping, my parents would cook up a bowl of golden egg noodles for dinner. Known as longevity noodles, they were chewy, hearty and satisfying. Like in many Chinese households, much of the food I ate was often accompanied by a story or superstition. Eating fish on Chinese New Year’s Day would bring good fortune. Dumplings were served when someone was leaving town. And a bowl of noodles was a staple dish for every birthday. I used to think these superstitions were simply cheesy jokes my dad made up to amuse us over the dinner table. But food has always been an important facet of Chinese culture and celebrations, and often serves as a metaphor for our aspirations, values, and beliefs. 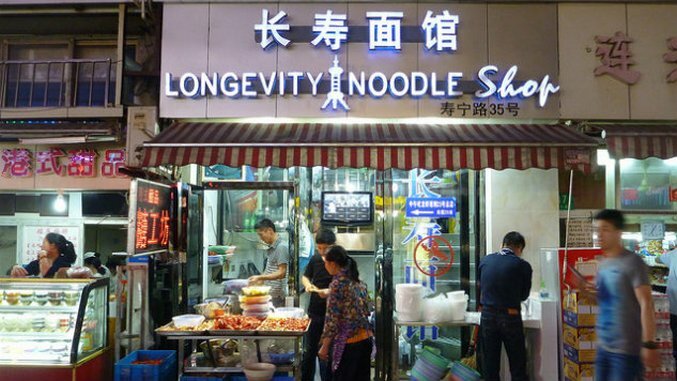 Longevity noodles were no different. Longevity noodles are indispensable for birthdays and celebration feasts. Typically, the dish is only made with wheat noodles, because rice noodles are too delicate and break easily. You can use any kind of wheat noodle variety you like, dry or fresh. Preparation of the noodles also depends on your tastes. Some prefer to eat the noodles plain or put them in a soup, and some prefer to stir-fry the noodles with meat and vegetables. Certain customs accompany the consumption of longevity noodles, depending on the region or household. For example, one custom has guests picking noodles from their own bowl and placing them into the bowl of the birthday honoree while wishing them fortune, happiness, and longevity. Another custom is to hold up noodles with chopsticks and admire how long they are with the other guests. There’s one custom that every household can agree on, however, and that is to never cut a strand of noodles — not unless you want to risk a shortened lifespan. In some areas, it is also considered a taboo to fill up noodles to the brim of bowl, as this would be equivalent to indicating a full lifespan. Although noodles were invented well over 4000 of years ago in northwestern China, the idea of longevity noodles became popular sometime during the Tang Dynasty (618 – 907). In a poem, Tang Dynasty poet Liu Yuxi once wrote, “Holding up noodles with chopsticks while citing verses to wish the newborn of a bright future,” implying a burgeoning tradition of eating noodles to celebrate a birthday. Another story recalls how Emperor Xuan Zong and his wife endured a time of hardship during his reign in the Tang Dynasty. But even though resources were scarce, the empress was able to exchange a purple shawl for a bowl of longevity noodles to give to the emperor for his birthday. Longevity is one of the most revered ideals in Chinese culture, along with happiness, fortune, and prosperity. Taoism, a philosophy imbued in China’s religion and culture, says that without life, there is no meaning, and therefore having a long life means everything. The Chinese character for longevity is shou, and its components each individually mean old, work, and time. Together, shou is the embodiment of hard work put into a life, ensuring that the life will last a long time. There is also a God of Longevity included in Chinese mythology called Shou Xing, which translates literally to “Star of Longevity.” He lives in a palace at the South Pole and keeps a garden of immortality herbs, and is usually seen holding a wooden staff in one hand and a peach (symbolizing immortality) in the other. His face is long, gentle, and smiling, and he is always depicted with a bald, enlarged head (symbolizing his collected wisdom) and a long, white beard. While it’s widely held that noodles became the food metaphor for longevity simply due their length, there is another explanation that could account for the longevity noodle’s origins. According to one myth, longevity noodles originated during the Han Dynasty. One day, Emperor Wu Di joked to his ministers that the length of the groove between the nose and upper lip (ren zhong) correlates to the length of one’s lifespan. Minister Dongfang Zhuo joked back that Pengzu, a legendary man from the Shang Dynasty who lived for over 800 years, must have had an extremely long ren zhong. People afterwards believed that a long face was therefore indicative of a long life. And since the Chinese word for face, mian, is homophonous with the Chinese word for noodles, everyone associated eating noodles with longevity (longevity noodles in Chinese is chang shou mian, literally “long life noodles”). Although longevity is most commonly associated with birthdays, it is also a theme in traditional Chinese funerals. The deceased is clothed in longevity clothes, the coffin is made of shou mu (“longevity wood”), and a longevity portrait of the deceased is displayed for worship. Some households eat longevity noodles on the day of the funeral, while others believe that to be taboo. The concept of longevity at a funeral may seem incongruous, but the idea of duality is long-held in Chinese culture. It makes sense – what makes a long life so precious is knowing that one day it will end. Longevity is about hoping for a long life, celebrating a life that has been lived well, and mourning life when it is gone. It’s an acknowledgment of your hopes and fears, wrapped up in the long strand of a noodle. So on your birthday this year, try this delicious recipe and wish yourself a long life. Just be sure the noodle doesn’t break. Elena Zhang is a freelance writer based in Chicago. Her writing can be found in HelloGiggles, Bustle, The Mary Sue and PopMatters, among other publications. Main shop photo by mcantelon CC BY-SA. Longevity noodles photo by Alpha.